How do I fit the Pizza Co. pieces in the storage container? These two pictures show how to fit the Pizza Co. pieces in the storage container. What is the Osmo Pizza Co. game? Osmo Pizza Co. is a money puzzle game. Quickly cook pizzas using the customers' preferred toppings to make them happy, then calculate their change using the Osmolian currency tiles*. Decipher how customers like their pizza from the facial and body language they make as you lay down toppings. Get it wrong and you'll receive a grumpy review, but get it right and they'll be ecstatic! Give kids a taste for how to run and grow a business. Save up your profits, so you can invest in upgrading your shop and become the pizza-making legend! * Note: Currency in Osmo Pizza Co. is not based on any real-world currency, and therefore has universal appeal. Where can I order Osmo Pizza Co.? 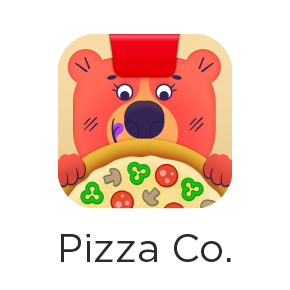 Pizza Co. is available for purchase worldwide on our website by itself and as part of our Explorers and Makers Bundles: https://playosmo.com/en/shopping/. It's also available for sale in select retail partner stores and online. How much does Osmo Pizza Co. cost? In the United States, Pizza Co. is $39 USD. What ages is Osmo Pizza Co. designed for? Uncle Tony wants to leave his beloved pizza shop in the capable hands of kids aged 5-11. The game auto adjusts to the child's ability. What is included in the Osmo Pizza Co. box? What is the educational value of Osmo Pizza Co.? Pizza Co. teaches children real-world math, money, fractions, and non-verbal communication skills. Run your own pizza shop! Quickly cook pizza & calculate change using toppings and money tiles. Invest your profits to upgrade your shop as you bake your way to becoming “the big cheese”! Do you have instructions for Osmo Pizza Co.? What are the names of the Osmo Pizza Co. characters? My kids love them! Uncle Tony's Pizzeria has tons of wacky customers. It's possible that one day, some might decide to go by their middle name, heck, a couple may even have a complete identity crisis. So, don't put too much down on these names quite yet. If you have ideas for fun names, please send them to support@playosmo.com, we'd love to hear them! What language do the characters in Pizza Co. speak? Pizza Co. has written words that appear on the screen, and those will be in the language of your iPad or the language you select. The spoken language of the characters is not a real language, it's make-believe. We plan to reveal more about this make-believe language in the near future. If you find the 'Osmolian' language distracting, please feel free to lower the iPad volume accordingly. The Osmo apps are currently available in the following languages: English, Chinese (Traditional and Simplified), Danish, Dutch, French, German, Italian, Japanese, Norwegian, Spanish and Swedish. Note that the tiles for the Words game currently only include English alphabet letters, and the Adventure Mode of the Words game is not localized. After you do that, open any Osmo app, and you will be prompted to select between English and your other language as the preferred language for that Osmo app. What is the currency used in Osmo Pizza Co.? The bills and coins are play money, with pictures of the Pizza Co characters' faces on them. We call it "Osmolian money". Since the money is not associated with any real world currency, it has universal appeal and relevance across the world. The idea is that once children learn the concept and practice of making change, they can then apply that concept to any real world currency of their choosing. Why doesn't Osmo see the pizza toppings or money I placed on the pizza crust in Osmo Pizza Co.? Your hand is covering the pieces. In this case, take your hands away from the pieces and Osmo should recognize them. The reflector is on backwards. The pieces are too close or too far away for Osmo to see. If this is the case, try sliding your pieces so that they're centered in front of the iPad. Do you have an iPad Mini/Air? Did you follow the special setup instructions here? Are you using it in an area with very low light? Try increasing the lighting in the room. Spot lights like desk lamps directly on the play area can create glare which can cause issues. If a lot of light is coming from behind the iPad, there may be lots of shadows where the camera is trying to see. Are you playing on top of the Creative Board (or anything raised above where the Osmo base is sitting)? If so, try taking that away. Try placing a plain sheet of 8.5"x11" white copy paper underneath the base (longways) and use that to place the pieces on top of. Is the reflector cracked? To request a replacement, please log into your myOsmo account and navigate to the account page underneath your name. Click on the Games link on the left, then scroll down to the replacement piece section and fill out the form. We'll send you an email confirmation that we received your request. If you continue to experience difficulty with the iPad seeing what's in front of it, please contact the Customer Experience Team at support@playosmo.com. What do I do if Osmo Pizza Co. crashes? Any time an app crashes, it's good practice to close other open apps (double tap home button and swipe the windows up to close them). Also please try reinstalling the Pizza Co. app and restarting the iPad. If it doesn't help, please write us at support@playosmo.com with your iPad model number. You can find the model number printed on the back of your iPad.